It is such an ugly word, but one I was forced to deal with while writing The Last Day of Forever and the second half of the story in An Eternity of Four Years. 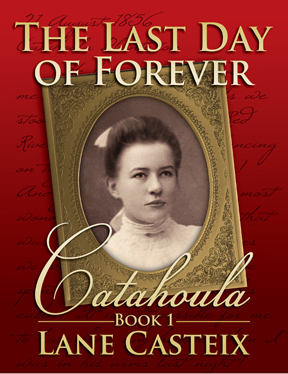 I began this project over 20 years ago, and when I wrote the first draft of The Last Day of Forever, never for a moment did I really give much thought to the issue of slavery. But the writing process forced me to think about it. 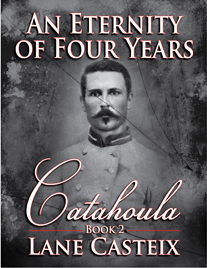 The story concept began simply as one about the exploits of the Louisiana Tigers during the Civil War. Everything else was written around that and ultimately pointing to it in some way. That isn’t how it ended up. First, it morphed into a love story, and while I tried to keep the focus on Rachel and Ethan, dealing with the character’s relationships with the slaves gradually emerged as an important underlying theme that had to be developed better. I grew up in the South during a very uncomfortable period in our history. Racism was common, acceptable, and never given much thought. My father’s doctor’s office waiting room was initially separated “white” and “colored” by a wall and an aquarium. My family on my mother’s side owned slaves prior to and during the Civil War. I am not proud of all that, rather I state it simply as a fact I must live with and to give the reader a frame of reference for where I am coming from. My first draft of the story presented the subject of slavery in a way that, in retrospect, was not honest. It was the Old South, white man’s view of the subject, and the slaves at Catahoula Plantation weren’t really mistreated but lived happy and productive lives leisurely picking cotton all day. But as I wrote the story, it became obvious that was not only dishonest, but it was wrong. As the attitudes of the main character, Ethan, and his issues with slavery began to more strongly emerge in the numerous rewrites, I was forced to face the uncomfortable truth that the issue of slavery had to be dealt with in a more honest manner. Gradually, the story was changed to more accurately reflect the truth of the times, but I did not want it to become a story about slavery. It is really about Rachel and Ethan and how people and the world around them so profoundly affect their lives and their relationship to each other. The question became how to balance that. It needed some stronger black characters dealing with the issues they faced during this time. That became Mammy, Old Zeke, his son Little Zeke, and Brandy in The Last Day of Forever, and Blue in An Eternity of Four Years. Brandy was the most interesting because of her plight, being mostly of white lineage yet still a slave. Her story brought the absurdity of the institution into sharp focus for me. I felt Ethan’s issues with the peculiar institution needed a root source, so I added the opening scene in The Last Day of Forever of the killing of Cornelius the slave. Some of my beta readers found it disturbing. That was my intention, although it was not included just for shock value. It plays an important part in Ethan’s developing attitudes towards slavery, and it comes back into the story later with an explanation of what and why it happened to flesh out the story arcs of other characters. Not only did the event profoundly affect Ethan and Brandy, but it also helped to define Morgan’s character. I also wanted the reader to understand how conflicted Ethan must have felt to hold views not commonly held by those around him. The story was written as if the events were being viewed through the eyes of Ethan and Rachel and told by them, thus one would naturally expect that perspective to be somewhat biased towards the prevailing attitudes of the times, and it is; intentionally so. In the beginning, slavery is simply a fact of life Ethan must live with and does so perhaps a bit too comfortably at first. But as the story progresses, he is compelled to face how he really feels, and he is forced by circumstances to act on his beliefs. It takes Ethan almost nine years to come to a full realization of where he stands on the issue, but we are yet to see a full manifestation of that. That will come in Book 3 (working title: The Avenging Angel), which takes Rachel and Ethan into the period after the war known as Reconstruction. There, the two of them really come face-to-face with the racism of the times. Where am I going with all this? I guess I want the reader to understand that although the story sometimes seems to treat slavery in a somewhat stereotypical manner, that is because Ethan is the main author, and he is telling the story in the context of the times and his own personal growth as a person. It was also a journey for me to have to explore my own feelings on the subject and in considerably more detail than I had ever done before. I can no longer look at a cotton boll in quite the same way I did before I started this.